Oak View Cottage07971916447work Self-cateringOak View Cottage is a detached, modern and comfortable accommodation, situated in a peaceful corner of the picturesque Monnow Valley. Surrounded by views of rolling fields, and the Black Mountains, this is a new build completed in 2014, that boasts all the necessities of modern life, while maintaining, a private, secluded atmosphere to enjoy a perfect week away in the country. Situated within the grounds of the owners home, this cottage has its own driveway, private patio and outside dining area, a large open plan kitchen and living room, 2 en suite bathrooms for both upstairs bedrooms, a ground floor sitting room with sofa bed and ground floor shower room. There is also a private balcony that extends off the master bedroom that makes for stunning sunset views. Oak View Cottage has recently been graded 5 star by Visit Wales. Monmouth high street is less than a mile from the cottage and is easily reached on foot, where there is a wealth of pubs and restaurants to choose from, as well as many locally owned shops. The surrounding area is full of opportunity for hikers and bikers. 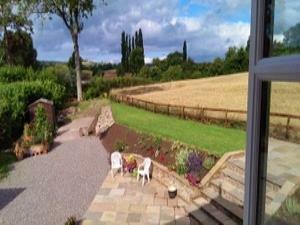 With footpaths leading from the cottage door into the fields beyond, and the Offas Dyke being close by. For golfers, there is easy access to some of the best golf courses in the country. The Rolls golf course is 10 minutes away by car, and The Celtic Manor Resort, just 20 minutes away. One of the views from Master Bedroom. Oak View Cottage is a detached, modern and comfortable accommodation, situated in a peaceful corner of the picturesque Monnow Valley. Surrounded by views of rolling fields, and the Black Mountains, this is a new build completed in 2014, that boasts all the necessities of modern life, while maintaining, a private, secluded atmosphere to enjoy a perfect week away in the country. The cottage is available for weekend, or week long bookings. HD Smart TV. Children welcome from any age.